Leandra, the Glasi dragon, rose in the night of 28 September 2005, spewing out fire and smoke, from the fathomless depths of Lake Lucerne. (View the video player.) 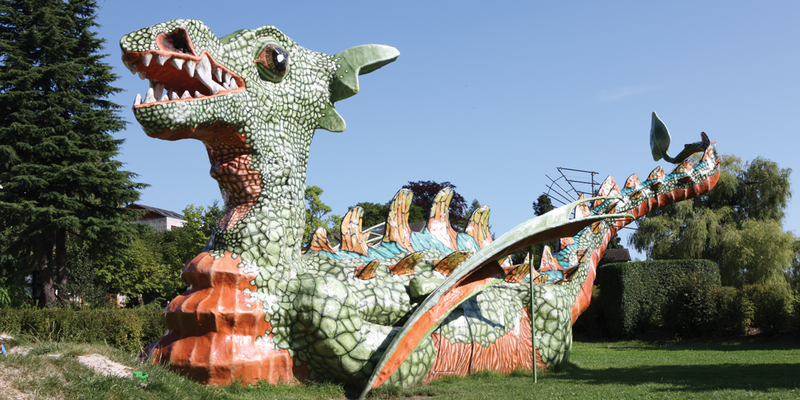 Now the dragon, measuring 12 metres in length and 4 metres in height, stands in the Glasi Park, giving delight to both young and old. The colourful beast was commissioned by the Glasi from Nidwald artists Franz Birvé und Elionore Amstutz. Associated products are a children’s story book, a jigsaw puzzle and a dragon plate.